Royal Law is an interesting phrase. That’s the only time it’s used in the entire Bible. James follows up mentioning this royal law by saying “you shall love your neighbor as yourself” which seems to be what he’s referring to as the Royal Law. Loving our neighbors as ourselves. And James says that when a person does that, they’re doing well. It’s going against the will of God when we show partiality to one person over another, because it is an unjust judgment. It’s putting yourself or someone else ahead of another person. And while it’s a sin, and while we can acknowledge that it’s a sin, and no one is perfect, James reminds us of the consequences of sin. And when we show partiality, we are guilty. When we judge others, when we fail to love people, we are guilty. I was playing baseball in my backyard with my friends when I was a kid. One day, we accidentally broke one of my neighbor’s windows. Think of sin like broken glass. When we sin against God, it’s not simply that we’ve broken a rule, but in our sin, we are shattering the window. A broken window isn’t partially broken. It’s totally broken. When glass is shattered, it’s only one part of the glass that’s initially struck but we see the impact of the baseball, or the rock, or whatever else is breaking the window affecting the entire pain of glass. And so when we sin against that Law, it’s not some minor, or small matter. Because the entire moral law is good because it comes from a good God. All sin is serious because all sin is going against God. Is James saying that all sins are created equally? The point isn’t that stealing a pack of gum is the exact same thing as killing a person. It is interesting that when we think of all of the types of sins people commit, truly wicked things that people do, James wants to put such a big emphasis on partiality. But partiality and love for people cannot be looked at as minor things. Because God forgives impartially, and the greatest example we have of impartiality is found in Jesus. Jesus was constantly associating with people on whom society looked down. Jesus associated with prostitutes. Some churches would look down on you for wearing flip flops to a worship service! The Jewish communities had Jewish tax collectors who would shake them down on behalf of the hated Roman government. These people were especially despised within their communities. And Jesus freely associated with them. Imagine someone hanging out with the sleaziest, sketchiest people you can imagine. Jesus taught the Parable of the Good Samaritan. The Samaritans were an ethnic group who were essentially half Jewish, but because they weren’t fully Jewish, there was racial tension between Jewish people and Samaritans. 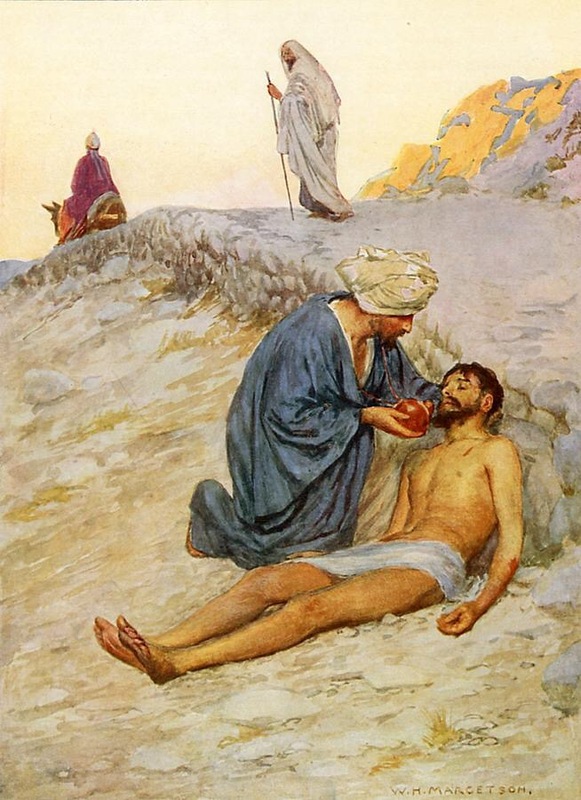 It was no accident that Jesus used a parable where the hero is a Samaritan. From that question, Jesus tells the Parable of the Good Samaritan. A man has been badly beaten. A priest passes by him and leaves him for dead. Then a Levite, who were also part of the Jewish priestly system also passes by and continues on his way. But a Samaritan comes, sees the man, tends to him, pays for his treatment. From that parable, the answer is clear. It’s the Samaritan who’s the good guy, who’s loving to his neighbor. In the parable, the man who was beaten had been left for dead, he was naked. There was no way to know who he was, where he was from. There was no way to know his class or social standing, what he did for a living, if he was even a good man. It was simply a person in need. Two others had passed by and kept walking. But the Samaritan tends to this man. For the priest and the Levite, no matter how religious or good they were, they failed at loving their neighbor. A person who was just as much in the image of God and they had an opportunity to show love and they failed. In Matthew 22, Jesus says that the greatest commandment is “You shall love the Lord your God with all your heart and with all your soul and with all your mind. This is the great and first commandment. And a second is like it: You shall love your neighbor as yourself. On these two commandments depend all the Law and the Prophets” (Matt. 22:37-40). We are commanded to love God. But to love God, to truly love God, to truly love God with all your heart and soul and mind and strength is to love God’s children, it’s to love the people who are created in the image of God. Is being partial all that big of a deal? Partiality cannot be thought of as a small thing. IT’S THE SECOND HALF OF THE GREATEST COMMANDMENT. It’s about loving God AND people. A Reece’s Cup needs both the chocolate and the peanut butter to be delicious. You can’t just say you love God and not love people. It’s not about picking and choosing. It’s both. And when we show partiality, we aren’t being loving towards people. Because when we treat people partially, when we put a person ahead of someone else, then we are not loving our neighbor as ourselves. So this is how we fail. We show partiality. And even if you don’t think that you do, you sin in other ways, and all sins are serious. ‹ Couldn’t God just forgive us? Why was the cross necessary?